Taking advantage of our broad network of experts and thought leaders, we decided to start a series of interviews with people we find (remotely) inspiring. And is there a better person to start with than Beat Buhlmann? Beat is an internationally recognized expert in the online field, focused on digital transformation, customer journey analysis and online marketing. He grew up in a country-side, family-run hotel and started his career with a 4-year apprenticeship as a car mechanic. He worked for renowned companies such as Google, Evernote, Dell and HP. His unique ability to bridge the gap between theory and practice shapes his unique approach to management. Beat is currently focusing on sharing his knowledge about Digital Transformation as well as Virtual Team Management (the latter being his doctoral thesis and the topic of his first book) at various leading universities around the world. Magda Sowierszenko: How did you start a career in management? Beat Buhlmann: After a couple of years in Presales and Marketing, I realized that working with people is something I truly enjoy – being in a team, being in it as a part-time teacher, or as a coach. Therefore, it became evident that people management is a logical next step in order to combine my passion for working more with people as well as getting out of my comfort zone and learning something new. M: What or who inspired you to write your book “Become the CEO of your own life”? -They start with the 2nd step (what can I do now) instead of the first step (who am I, what are my values and my no-goes, aka as the foundation of the person). One of the key elements of the Swiss PDP Approach® is its non-silo approach. 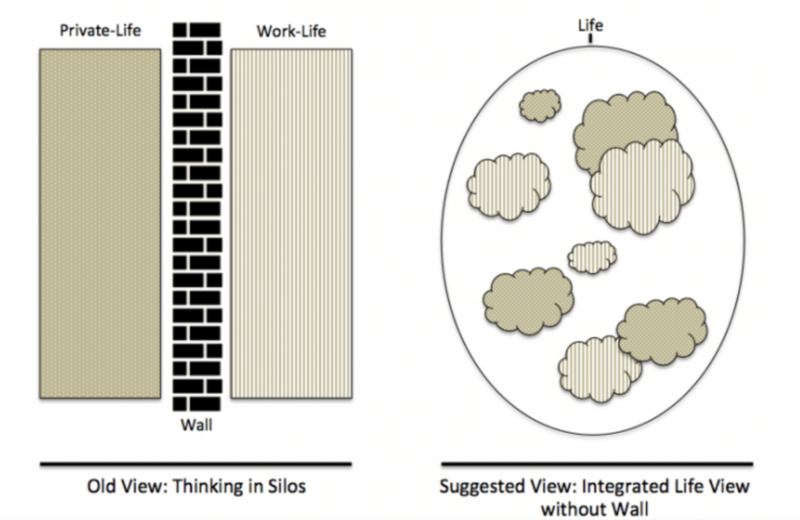 Far too often, people raise a wall between their private life and their work life (creating two silos). However, that does not make sense – what happens in your private life has an impact on your work life and vice versa. Therefore, I suggest a holistic, integrated view. Therefore, my PDP approach does not talk about career development, but life development (combining private and business life) in order to get the big picture. M: Did you always know you want to help people in “life management”, or did this came naturally with your working experience? B: Actually, working so intensively in the field of life management coaching was not my plan when I set out to start my career after graduation. As I began working, I quickly realized the importance of distinguishing between people management and business management. I also realized the importance of allowing and encouraging individuals to accomplish goals not only professionally, but also in their personal lives — both parts are important if you want to create an environment of trust in the workplace. However, in today’s rapidly changing and hectic workplace laden with distractions and constant overload, managing one’s own life can be a challenge. To this end, I created a personal development plan (PDP) called the Swiss PDP Approach®. M: Guide us through the 3 steps of your Swiss PDP Approach®. Objective of step one is that you get to know yourself. That may sound obvious and easy, but it is usually not. However, it is crucial… and a super-interesting task, too. To reach our objective, you will first create your life-map. A life-map is actually a double mind-map: a private mind-map and a professional mind-map on one page. It is crucial to have the big picture on one page in order to connect the dots and finally make meaningful decisions. A double mind-map on one large sheet of paper suits this purpose well. Add everything. 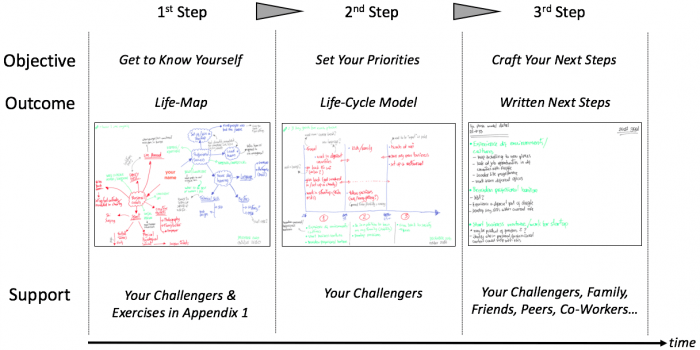 In order to get the most out of this exercise, and to get to life-map version 2.0, you need some help – you need other people. You will need to choose at least two to three people you trust that will challenge you. People that know you from different points of view. Make sure you choose people who are honest, direct and who tell you the truth. Do not choose people who simply say yes to everything or people who just want to please you. You need challengers… tough guys. Show them individually your life-map, they may add crucial things or be your eye-opener reg. blind spots. This exercise will force you the set priorities. Look at the example: this person realized that he planned too much in the current life-cycle, and started moving things around. What is missing? Crafting the next steps. That sounds easy, and it is, given your hard work on life-map and life-cycle-model, truly much easier now. Moreover, crafting next steps now is also more meaningful as you got to know yourself much better. Step three is now really up to you. Based on the outcomes of step one and two, especially step two with its time dimension, you should have a clear idea what you want to start with next. Just bear in mind: it is not just about what you would like to do in the current life-cycle (aka the short-term life-cycle), that is pretty obvious. It is also about things that you would like to do later on, but which may require something else before. M: You have previously worked in Evernote. What has been your biggest challenge there? B: I started in a non-growing market with the lowest employee satisfaction score – so mostly unhappy team members. Further, almost no budget for business development. Therefore, together with the team, we jointly developed low-cost-high-reach marketing and PR approaches and executed them fast. It worked 🙂 Revenue grew, the employee satisfaction score too. M: In your opinion what does Evernote do differently, in terms of Talent Management, from other organizations? B: That is not easy to say in general. It really depends on the people manager: does he believe in people development or not. If yes, he/she does a lot – if not, nothing really happens. This is true for all the companies I have worked for. M: I need to ask you advice on one thing – how do you successfully onboard remote members? B: I think it is the wrong question or at least not the right order :). My ‘onboarding’ actually starts during the job interview. I changed the hiring process for virtual team members in order to take the ‘virtual team skill set’ into account during the recruiting process. In other words, besides the actual job skills, I also check the minds and the virtual team skills of the candidate. More about how to hire and run a virtual team can be read in my short articles [here] and [here]. M: What’s your view on the hard vs. soft skills debate? Is one more important than the other, in a distributed environment? B: In general: both are important, but depending of the job, at a different level. However, it is very clear that in a distributed team (virtual team) setting, soft skills aka interpersonal skills are even more important given the fact that often, you cannot see and read the body language, or because of email, you don’t even have the tone. So the soft skills to foresee a bit more, the think a bit more ahead, and to put yourself even more on the other person’s shoes to better anticipate are instrumental. A recent MIT study revealed a further, interesting insight: What makes for a smart Group? The individual IQ-levels? Outcome: Having a bunch of smart people does not make a smart group. If you have a group of smart individualist (egoists…), not sharing anything, not listening to others, then the group smartness goes down as well as the achievements of such a group. So if it is not IQ, that makes a smart group, what it is? You need not only intelligent people, but smart people with a high level of inter-personal skills. And they are evermore important than you may think. M: You’re among the few managers who is combining field experience with continuous academic research. Do you feel there is a need for managers to “review the basics” of management? B: Absolutely. The world has changed a lot – who still goes to work by horse? 🙂 Joke aside: absolutely. If you don’t know what you don’t know, then you are in a dangerous spot. Given the various technical and societal megatrends and their implications on practice, you cannot run a business (and manage people…) as you did 20 years ago. M: So, say you can go back in time to when you first started your career. What would you do differently? B: I would say … focus even more on fewer things and do not choose jobs, but people you wanna work WITH and work FOR. 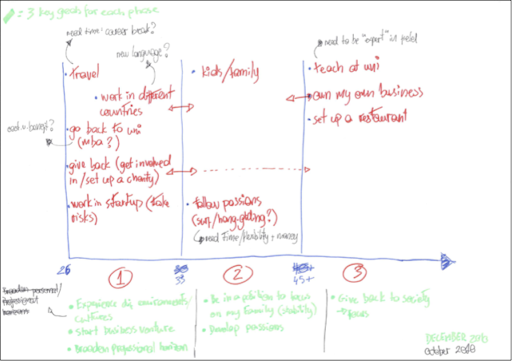 M: What is your one advice for managers who handle or would want to handle, distributed teams? What should they look out for? B: Don’t read 500-pages books. Do not listen to scholars who have never worked in a real-life environment. Listen to people who have made mistakes in practice and therefore had the chance to really learn what matters and what not. Therefore, try to read practice papers [here some example]. Practice papers differ from classic whitepapers with a very short problem statement which everyone understands, then immediately followed by practical recommendation you can apply the next day without needing 100k$ budget.